Sweat it off – sauna season is here!!! It didn’t take long and we gave up on saying – “This in such a nice autumn.” “Oh my god, the weather is so nice today.” “It feels like summer, right?” and “Oh gosh, it’s so hot, I didn’t expect the weather to be like this.” Real grey autumn aka winter is here. But we say yaaay! Why? Because it means sauna season is finally here. Infinity Wellness Hotel Step – situated in the area of Vysočany (Prague 9), it is not so easily reachible for city centre people, but definitely worth it. Five various saunas, large relax zone with a terrace where you can enjoy your tea with a city (also a little bit industrial) view. Especially recommended by night or when snowing. The spa offers sauna rituals, as well. 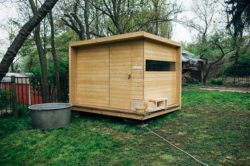 Dvorce – beautiful sauna world at Podolí (Prage 4) just near the river. 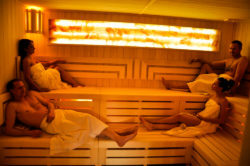 They have six saunas and a wonderful area with a sauna bar and many chairs for your perfect relax. From one of the saunas there is even a river view! Sauna spot even offers special prices in the morning during the weekdays, so check out their website for actual info. Lázně na lodi aka spa on the boat – so exciting! Unforgettable experience as you might feel a little bit dizzy from the swinging boat. Big pro: you can cool your body down in the Vltava river. Cons: it could get a little bit crowdy as the capacity is 16 persons only. Saunia is a brand with four branches among Prague, mostly situated in the shopping centres (Chodov, Černý most, Galerie Nové Butovice, Hostivař). This means the atmosphere is probably not so special as for example at Dvorce (even if the interior is very cosy, too! ), but the prices are very reasonable and your time in sauna in unrestricted. This means you can take your favourite book with you and enjoy your spa time without having to check the clock every fifteen minutes. Klubovna – this one is for truly big fans. It is a tiny sauna for 4 pax only, you have to book ahead and you get to use it for 90 minutes only. 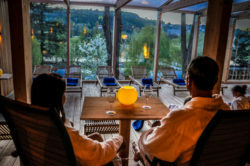 However, situated in a lovely garden of a Klubovna cultural centre at Prague 6, you can connect your spa with a coffee or drink afterwards. Get prepared you won’t get any towels or sheets and you will have to have your cold shower in the garden, but take it as a funny experience with your friends or partner. What about you? Do you like spa and sauna? And have you visited any in Prague yet? Now you have the whole long winter to find out which one is the sauna od your heart. Looking forward to your experiences!